By James R. Jacobs in Doc of the day, post on May 3, 2015 . This is an unbelievable story about the FBI being complete jerks about the FOIA requests they’ve received from MuckRock in regards to fake cellphone towers called “Stingrays” which are used to “gather identity/location information” on everyone that passes by them — which btw I had no idea these things were real! MuckRock received almost 5000 pages of FOIA’d documents which were almost completely redacted. I wonder how this is meeting the Obama Administration’s [[Open Government Initiative]]. The Stingray — a fake cellphone tower that gathers identity/location information on everyone who passes it — is the worst-kept secret in law enforcement, but that doesn’t stop feds from going to absurd lengths to pretend they don’t use them. We know that police departments have to sign non-disclosure agreements when they buy Stingrays, and we’ve even seen them lie to judges about how they acquired their evidence to maintain their non-disclosure obligations. We’ve seen US Marshalls raid city cops to steal Stingray evidence before it could be introduced in court (even more dismaying — it worked, and the case against the cops collapsed because the evidence had been disappeared down the Marshalls’ memory hole). Since 2014, Muckrock has been firing out Freedom of Information Act requests about Stingrays to agencies at all levels of government, using crowdfunded dough to pay for it. 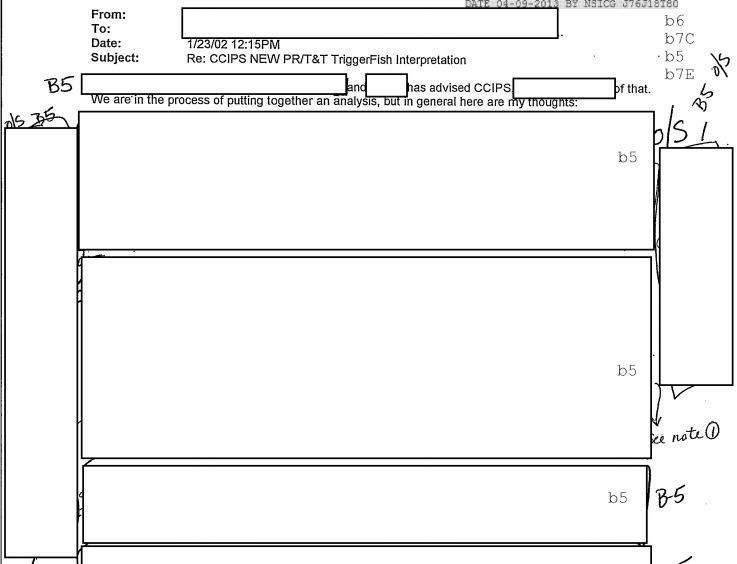 The fun-loving feds at the FBI have turned over 5,000 pages of Stingray records in response to one set of Muckrock requests — but they redacted virtually every word on every page first. “We know that police departments have to sign non-disclosure agreements when they buy Stingrays, and we’ve even seen them lie to judges about how they acquired their evidence to maintain their non-disclosure obligations.” Wait a minute. It’s easy to read this sentence and agree that police departments are completely helpless. That they have no choice. That they are forced to buy Stingrays. I hate to sound old-fashion, but what about the Fourth Amendment? Our indifference, apathy, complicity, timidity about defending liberty for all is not without consequence. too true Jim. That’s definitely unreasonable search and seizure without probable cause. You’d think that police depts would know that.